The Helsinki Olympic Stadium, located in the Töölö district about 2.3 kilometres (1.4 mi) from the centre of the Finnish capital Helsinki, is the largest stadium in the country, nowadays mainly used for hosting sports events and big concerts. The stadium is best known for being the centre of activities in the 1952 Summer Olympics. During those games, it hosted athletics, equestrian show jumping, and the football finals. The following new Olympic records was set during this competition. Qualifying Performance 5.30 advance to the Final. Venezuela competed at the 1952 Summer Olympics held in Helsinki, Finland. 38 competitors, 36 men and 2 women, were selected by the Comité Olímpico Venezolano to take part in 37 events in 8 sports. For the first time, women took part in a Venezuelan representation in the Summer Olympics. These were the fencers Gerda Muller and Ursula Selle, both competing in individual foil. Women's were absent of Venezuelan representations in four occasions including next summer games held in Melbourne. The 1952 Games were considered a great step forward in sports in Venezuela since previous Venezuelan delegation was of only one athlete. Asnoldo Devonish won the nation's first ever Olympic medal and to date only Olympic Medallist in Athletics. Yvette Winifred Williams is a former New Zealand athlete. She became the first woman from her country to win an Olympic gold medal and hold the world record in the women's long jump. In the 100th anniversary of Athletics New Zealand in 1987, she was named "Athlete of the Century". Mikio Oda was a Japanese athlete and the first Japanese Olympic gold medalist. He was the first Asian Olympic champion in an individual event. Olga Gyarmati was a Hungarian all-round athlete who competed at three Olympic Games in four different events. Her greatest success was winning the inaugural Olympic Women's Long Jump competition in London in 1948. Additionally, she won two Universiade gold medals and a number of Hungarian Athletics Championships titles in sprint and jumping events. Olha Saladuha is a Ukrainian triple jumper. These are the official results of the men's pole vault event at the 1952 Summer Olympics in Helsinki, Finland. The final was held on Tuesday July 22, 1952. These are the official results of the women's long jump event at the 1992 Summer Olympics in Barcelona, Spain. There were a total of 35 participating athletes and one non starter. 6.75 metres to reach final or best 12. The Men's triple jump at the 1952 Olympic Games took place on 23 July at the Helsinki Olympic Stadium. Brazilian athlete Adhemar da Silva won the gold medal. Evelyn Tokue Kawamoto, also known by her married name Evelyn Konno, was an American competition swimmer and two-time Olympic medalist. The women's 200 metre breaststroke event, included in the swimming competition at the 1952 Summer Olympics, took place on 26–29 July, at the Helsinki Swimming Stadium. In this event, swimmers covered four lengths of the 50-metre (160 ft) Olympic-sized pool employing the breaststroke. It was the sixth appearance of the event, which first appeared at the 1924 Summer Olympics in Paris. A total of 33 competitors from 19 nations participated in the event. The women's 200 metre breaststroke event, included in the swimming competition at the 1956 Summer Olympics, took place on November 29–30, at the Swimming and Diving Stadium. In this event, swimmers covered four lengths of the 50-metre (160 ft) Olympic-sized pool employing the breaststroke. It was the seventh appearance of the event, which first appeared at the 1924 Summer Olympics in Paris. A total of 14 competitors from 10 nations participated in the event. This was a decrease from the 1952 Summer Olympics, because the breaststroke event was split into the 200m orthodox breaststroke and the 100m butterfly event. The Men's long jump at the 1952 Olympic Games took place on July 21 at the Helsinki Olympic Stadium. American athlete Jerome Biffle won the gold medal. The Men's high jump at the 1952 Olympic Games took place on 20 July at the Helsinki Olympic Stadium. 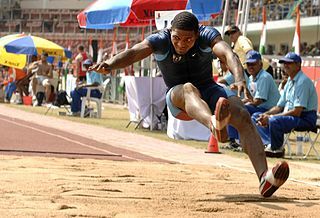 American athlete Walt Davis won the gold medal and set a new Olympic Record. The Women's high jump at the 1952 Olympic Games took place on 27 July at the Helsinki Olympic Stadium. South African athlete Esther Brand won the gold medal. The Women's javelin throw at the 1952 Olympic Games took place on 24 July at the Helsinki Olympic Stadium. Czech athlete Dana Zátopková won the gold medal and set a new Olympic record. ↑ "Athletics at the 1952 Helsinki Summer Games: Women's Long Jump". sports-reference.com. Retrieved 14 December 2017.